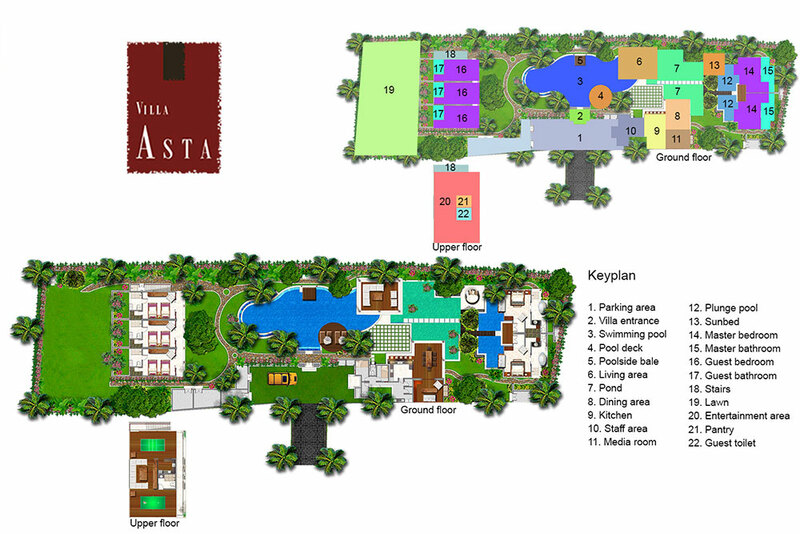 Villa Asta’s generous accommodation is spread across four pavilions set around two swimming pools separated by koi ponds. At one end of the garden a two-storey pavilion houses three guest bedroom suites and, above, an enormous open-sided games room with kitchenette and shower room. A single-storey pavilion with two master bedroom suites sits at the other end, reached via flagstones across koi ponds and a bridge across the second swimming pool. In between is double-decker poolside balé, an open-sided living pavilion, and a separate dining pavilion with service kitchen, bar and adjacent TV room/study. Three guest bedroom suites occupy the ground floor of the entertainment pavilion at the far end of the garden. Accessed by sliding glass doors from a colonnaded terrace, these air-conditioned rooms have twin beds that can convert to a king, with two roll away beds tucked under. Each has the convenience of a walk-in wardrobe, and an ensuite garden bathroom with walk-in shower looking onto a traditional ’mandi’ - an urn fed by a waterspout.